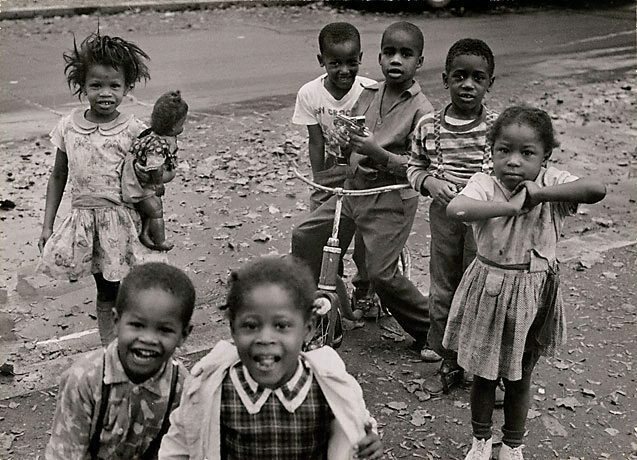 U.S.A., children in Washington D.C.
David Moore was Australia’s most renowned and widely travelled documentary photographer. He began working as a photographer in 1947 in the commercial advertising studio of Russell Roberts. Between 1948 and 1951 he assisted Max Dupain, and began to develop his own approach to the documentary style, walking the streets of depressed inner-city suburbs of Sydney taking still photographs. Moore’s ‘Redfern interior’ 1949 was included in Edward Steichen’s ‘Family of Man’ exhibition, which toured internationally from 1955. Moore was one of two Australians to be included in the exhibition. In 1951 Moore turned down the offer of partnership with Dupain and moved to London to work for international picture magazines including the Observer, the New York Times, Time-Life, Look, and Sports Illustrated. From 1958 he travelled the world for the New York agency, Black Star, working for Time-Life books, National Geographic and corporate and industrial clients. His international assignments took him to Asia, America, Antarctica and Africa until the 1980s. Moore’s photographs are held in Australian and international collections including the Museum of Modern Art, New York; Bibliothèque Nationale de France, Paris, and the Smithsonian, Washington, DC. Throughout his career, Moore demonstrated an astute ability to photographically articulate instances of serendipity and the conjunction of unexpected elements. He used the pictorial plane to draw disparate subjects into relationship with one another. As Judy Annear, senior curator of photographs at The Art Gallery of NSW, noted in 1997, Moore’s work is united by his ‘ongoing fascination with the structure of the image within the frame: its geometry and, within that geometry, the relationship between all the elements depicted, no matter how small they may be’. Whether photographing anthropomorphic objects or political events, Moore delivered sharp observation, dry wit and a sensitivity to form and composition. Signed and dated l.l. verso, pencil "...1956/ David Moore".